Experience with us one of the most beautiful stages of the wine production in the famous Douro Valley: the Harvest. We'll take you to an Estate in the heart of the Douro Demarcated Region where you will be able to Pick and Stomp the Grapes in the lagar! Wine Tasting and a Regional Lunch at the Estate are also part of the plans for this amazing day you’ll spend in between the vines. Do not miss this unique opportunity! ✓ Stop at two of most beautiful viewpoints of the Douro Valley. 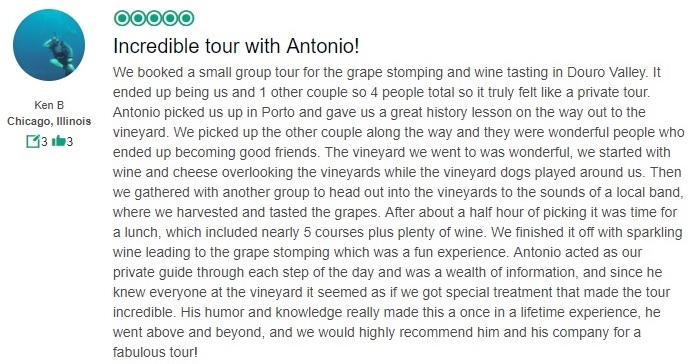 The video shown above is a sample of what we can offer in the Douro Region, it is not an exact representation of this tour. As we approach our Winery for the day we start seeing the beautiful vineyards that surround it. We finally arrive to the Wine Estate and start by visiting the Estate gardens. In the late morning we will have a wine and appetizers tasting assisted by the Oenologists of the Estate. Already with a bit of wine in our system to cheer us up, we go to the Vineyards to start the grape picking! Out here you need to earn your lunch, so only filled up baskets are accepted! The Douro is famous for still doing some of its wine by stomping by feet, so now it’s time for you contribute to the tradition: all to the lagar! Prices shown include VAT at the legal rate. Other ways to reach us would be by our e-mail: geral@bagoduva360.com or through our phone numbers: (+351) 932 987 000 and (+351) 929 143 445. ✓ You want this tour to be private. Would you like to see more options of trips?